Are you looking for fun ways to challenge yourself over the weekends? We say start off with an artificial wall in Goregaon and hone your climbing skills. 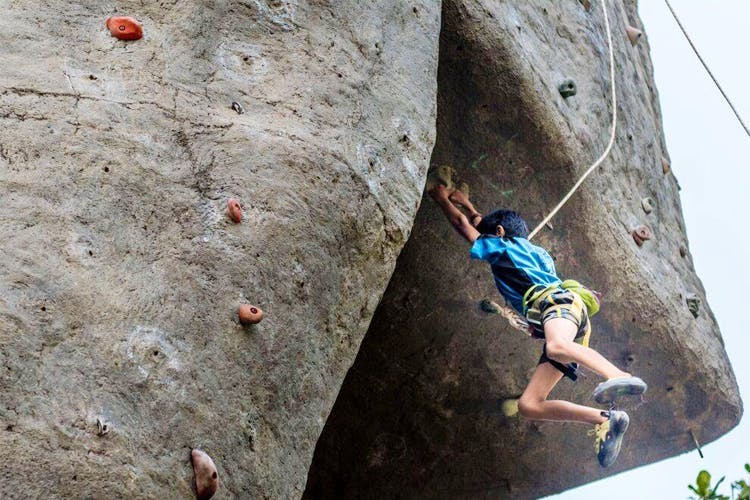 Arun Samant’s Wall climbing wall in Goregaon is perfect for anyone who’s looking to get some workout done in a not-so-conventional way. The wall is open to everyone and was constructed in the memory of Arun Samant – a mountaineer who lost his life on a mountaineering expedition to the Himalayas. Keeping the spirit alive, the wall often sees kids as young as 10 years old to office-going people in their 40s. It’s open to all and charges a very nominal fee for the wall climbing sessions. The instructors there are super helpful and will guide you through the process. As safety comes first, the patrons will be harnessed carefully and watched over by instructors. For registration they will charge a nominal fee of INR 50, and first time climbers will have to pay INR 120. Once you’re a regular fellow, a session for two hours of wall climbing is priced at INR 70 – which goes into the maintenance of the wall. It’s open on all days except Tuesdays and the sessions in the mornings are from 7am to 9am and in the evenings from 7.30pm to 8.30pm. Wall climbing is a fun and a challenging activity for everyone involved. It’s a great way to get out there and work out sans the intimidating machines at a gym. If it helps, think of it like your personal Everest and scale it proud and well.